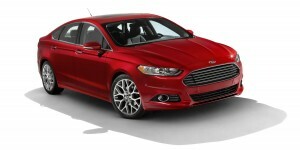 For 2013 Ford has completely redesigned the Fusion. As a family sedan the Fusion was a good car. Now it is a great one. Gone is the 3-bar grill that reminded some of a triple blade razor. Now the front-end looks like one that belongs on a luxury car such as a Maserati or an Aston Martin (for the record Aston Martin was a wholly owned subsidiary of Ford until 2007). There is no way around it, the new Fusion is cool. When you compare it to competitors such as the Chevy Malibu or the Toyota Camry the difference in appearance is striking, the Fusion seems sharp and sophisticated, the others… bland. In fairness to the Malibu and the Camry they are not bad looking cars, its just that the Fusion is a standout, aside from the ’65 Mustang it may be the best looking car Ford has ever created. Fusion base model interior. Silver trim and soft-touch materials make it better than most. Even the base model Fusion is well equipped with its only drawback the steel wheels and their plastic covers. When is the last time you saw a manufacturers base model and didn’t want to run away from it – especially when you saw the interior. When the base model of a car is this good, you have to question how much better can the higher priced models be? The answer, of course is, a lot better. There are 7 models of the Fusion to choose from including a hybrid and a plug-in/hybrid “Energi” model. The Energi is in limited release, so you won’t be seeing them in the Midwest anytime soon, currently it is only available in CA and NY. I won’t try to cover all 7 models of the Fusion, just the ones I believe most people will be interested in. I’ve highlighted them in the table below. Everything about the Fusion screams quality. When you close the drivers door it makes a nice satisfying thunk… I heard a similar sound when closing the door of a $90,000 Porsche a few years ago. Everything about the Fusion seems well made, even the standard radio has better sound quality than you would expect. Even the lowest priced model of the Fusion, the Fusion “S”, offers more than you would expect: one-touch up/down for driver and passenger power windows, soft-touch materials and LED taillights. As good as the base model is, I suspect most people will pony up the extra $2000 for the Fusion SE. When you drive a Fusion, you feel connected to the road. Unlike some mid-sized cars, the Fusion doesn’t lumber into a corner and then wallow out of it. Not to say its a sports car – if you want the flat cornering of a Camaro or a Mustang by all means buy one – but if you want a controlled ride, where you don’t feel every pebble in the road, and if you sometimes need to have passengers ride in back, you cannot do much better than the Fusion. The major controls are well laid out and easy to find – Toyota might want to take a look at the Fusion hybrid the next time they update the Prius – the parking brake is next to the gear-shift where most people expect it to be, not on the floor. The seats are comfortable but maybe should be a little firmer so they are more in keeping with the European styling and ride of the Fusion. The Fusion wasn’t the quietest car I’ve ever driven, but it was very good. There was little tire noise and the engine was quiet except when under strong acceleration. 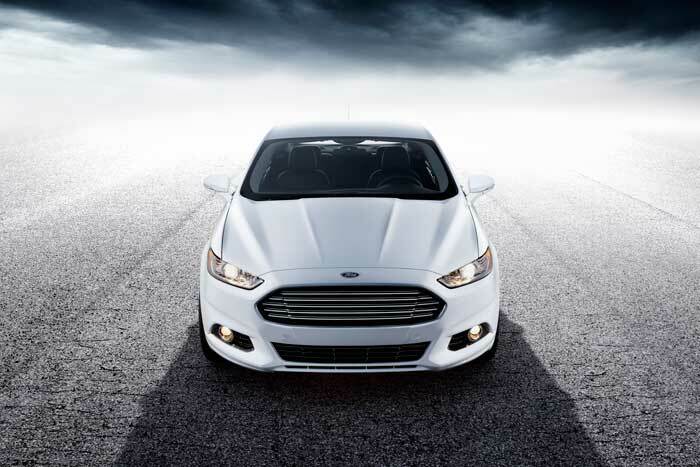 The Fusion accelerates smoothly and powerfully, most drivers will find the base 4-cylinder engine meets their needs. If you need stronger acceleration for commuter driving (in a city like Chicago for example), two 4-cylinder turbo-charged engines are available: the 1.6L EcoBoost and the 2.0L EcoBoost. The 1.6 liter engine delivers 178 horsepower and 173 pounds of torque yet still get 23 mpg in the city and 36 on the highway. The 2.0 liter engine delivers 240 horsepower and 231 pounds of torque but mileage drops to 22 mpg city and 33 mpg highway. 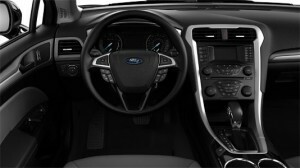 New for all 2013 models of the Fusion is Ford’s SYNC voice activated communications system. 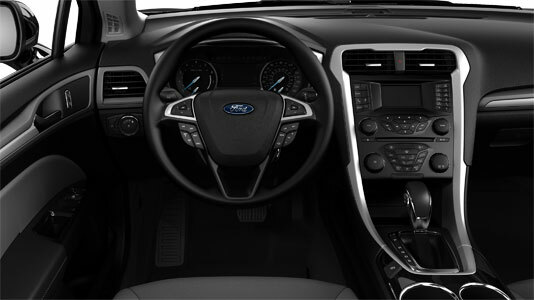 On the base model Fusion there isn’t all that much to voice activate other than your phone and the radio, but as you move up the model line you can use voice commands to change the climate controls, get travel and navigation information and more. The voice commands do take a little getting used to. At first I spoke slowly and enunciated each word with care. That is not the way to do it. The key to the SYNC system is to speak in your normal voice. It wasn’t long before I was changing radio stations and climate controls with ease. My wife wasn’t nearly as interested in the SYNC system as I was but she appreciated the quiet ride and comfortable seats. She also noticed that, like most cars, there was no good place for her to put her purse. The mid-size sedan market is the bread and butter of most automobile manufacturers – it isn’t the most profitable segment, but it has the highest sales volume – it’s what keeps the doors open for manufacturers like Ford, GM, Toyota and Honda. Due to the importance of this market segment the competition is fierce and good deals are sometimes available. In the table below I’ve compared the Fusion with two similarly equipped competitors: The Toyota Camry SE and the Chevy Malibu 1LT. As you will see these cars are very similar in size and miles per gallon, with the Camry having a very slight edge. The Fusion and the Camry are nearly identical in price, but in my experience Ford dealers are more willing to negotiate on price than Toyota dealers. Quick Comparison Table – All cars comparably equipped (exceptions noted) with 6-speed automatic transmission and 17” alloy wheels. The Fusion is new for 2013 so there isn’t any reliability data available. The previous version of the Fusion was rated above average in reliability by a leading consumer magazine. One of my few concerns about the Fusion is its front-end. There is no protection for the front grill and it looks like even the slightest impact would demolish it. The front-end of the Fusion adds so much to its attractiveness I hope it is more durable than I think. 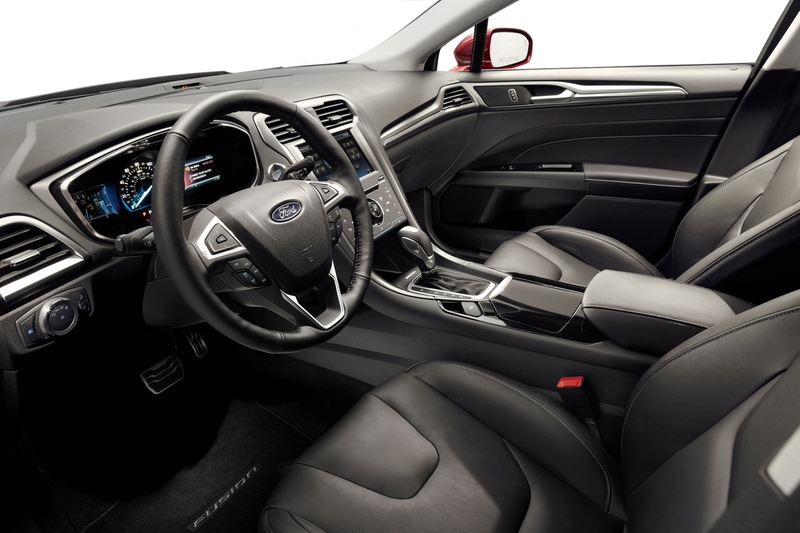 Overall the 2013 Fusion is another step forward for Ford. The Fusion is a very attractive sedan that gets good gas mileage, rides and handles well, is quiet and can carry five people and most of their luggage; except the hybrid versions which have significantly less cargo space. Several mainstream auto magazines have named the Fusion their car of the year. If you have any questions about the Fusion, feel free to leave a reply. I try to answer questions within 36-hours, often sooner.